One of the main reasons for the existence of your business is to make profits. No honest business owner would tell you otherwise. Even if you invest heavily in responsible corporate practices, distribute business money to the needy or encourage your employees to contribute to society by taking paid time off work, the importance of profits can never be undermined. The fundamentals of maintaining healthy business profits always go back to the same thing – minimizing costs and maximizing revenue. In order to help you increase your profits, we have included 10 tips that will help you accomplish your goal. The more people come to your business premises or website, the greater are the opportunities for you to convert interested leads into paying customers. Therefore, you need to have systems in place (like a well thought-out sales funnel) that nurtures leads into becoming loyal, paying customers. Before this can happen, you need to create the marketing and advertising that bring leads to your business. For example, if you get 10 leads per day and convert 2 people into customers, you are only converting 20% of your leads into customers. Even if you increase your leads to 20 per day, you will convert 4 people, leaving you with the same conversion rate of 20%. The key to increasing your conversions is creating more leads. You will need to focus on creating content, marketing materials and sales processes that grab attention and hook people on to the unique value you are offering. Now that you have more leads coming into your business, you will need to convert these leads into customers. Tools such as good blog content are what creates leads. Unless you have a specific call-to-action that directs people to purchase your products or service, your blog will not be a sales engine. Your blog is only your marketing engine. You should be directing readers of your blog to sign up to your email list. Your email sales and marketing campaigns are where your sales conversions occur. When people sign up to your email list, they are communicating the fact that they are a very warm lead. They want you to sell your products and services to them, but they will only make a purchase if your content further establishes the value being offered. Therefore, your email marketing content needs to state the problem, why it exists, and how your offer is the most effective solution. Using this formula will increase the number of leads being converted into customers. You should also use well-designed landing pages with persuasive copy for lead conversions. Landing pages are sales-focused websites that people land on when they click on a Facebook advertisement link, for example. Landing pages are purely focused on making sales and nothing more. The content on these pages need to communicate the value you provide if people were to become your customer. Your goal is to provide the type of content that compels them into making the decision of becoming your customer. If you want to make a profit, you will need to focus on increasing the number of products you sell. Consistent sales at a low volume should never lead you to complacency. You need to gain more exposure through great marketing to increase your reach so that your sales increase as a result. It is also a good idea to focus on multiple marketing channels that help to make your business be seen on multiple platforms. While Facebook may be your best marketing platform, you should also look at options such as LinkedIn or Instagram. Dependent on what you sell, you will need to find the best platform or the best combination of platforms and channels to reach as much of your target market as possible. This helps to increase the success of your marketing campaign. This has to be complemented with a corresponding increase in sales efforts to increase the number of transactions. More landing pages, paid ads online, events, roadshows, etc. are all avenues for you to explore to ensure that your sales numbers increase. Do not stop at selling the initial offer to the prospect. You should always look for ways to upsell so that you make more money on the sale. You effectively upsell by knowing what is going in in the prospect’s personal life or business life. When you know this information, you can suggest other products or services that will complement the one they are already purchasing. You may get a no, but the potential for a yes for outweighs any rejection you are fearful of facing. When you are trying to increase your profits, you cannot be scared of being a little aggressive in order to produce a better deal that earns you more money. 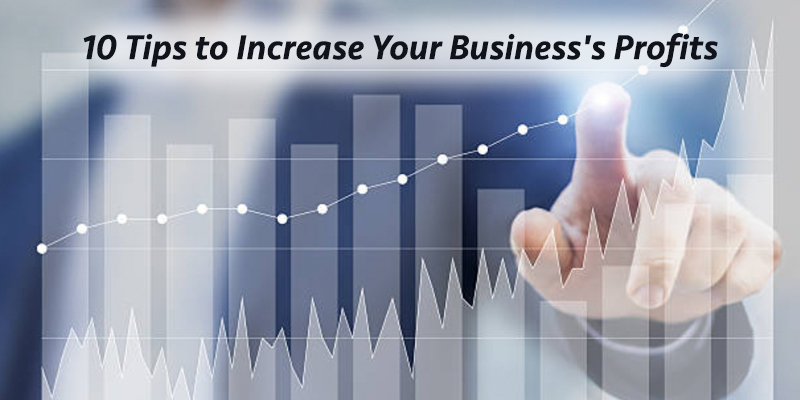 The only 2 ways to increase your profit margin is by increasing your prices or by reducing your costs. If you can do both at the same time, that will lead to a very big boost in profits. But, in reality, you can probably only achieve one. The problem with increasing prices is that you may run off your existing customers. Therefore, most people tend to focus on reducing their costs in order to increase their profits. There are probably numerous things that you are spending money on which bring no value to your business. You will need to determine what these expenses are so that you can get rid of them immediately. Once you do this, you will start to see more money being left over in your business after expenses have been paid. You may not know this, but the marketing and advertising you spend money on is the cost of acquiring your customers. If you have to spend $20 per customer, that is a lot of money, especially for a small business. You will need to determine how you can create better marketing campaigns for less money, while acquiring more customers. This is done by focusing on value, rather than on trying to be flashy. Creating and maintaining happy customers means more people talk about your business, increasing brand awareness and generating leads. When your existing customers love the service that you are providing to them, they will want to tell their family and friends why they should become a customer of your business Word-of-mouth marketing is one of the best forms of marketing. It is the best validation that your products or services are worth their advertised price. New customers will feel they will are get their money’s worth after purchasing your offer due to the sheer number of enthusiastic past customers. If it costs more to provide the service you offer than it makes after sales, you need to immediately stop offering that service. It makes absolutely no sense to lose money on a sale. When this happens you are having to increase your sales in other areas to compensate for the loss of money you experience when providing that costly service. If the cost of providing that service cannot be reduced, then it must be discontinued. Your customers will not notice the loss if your other profitable services provide even more value. The money you spend to make money determines your break-even point. If you spend $1000 on making a product or providing a service, you will need to make $1000 to break even. You may be happy with spending $1000 to make $1500 in sales. But, why not spend only $500 on making the product or providing the service, and make $1500 on sales? When you can decrease the amount of money you spend to make money, and bring in more money as a result, your business will increase its profits. This is money that can be reinvested into your business or saved for any slow periods that may occur. You may be hesitant to raise your prices. But, if you are providing products and services that have immense value, your customers should not have a problem if you decide to increase your prices, especially if you have a truly unique value proposition not imitated by your competitors. This will help to weed out customers who are cheap, leaving you with customers who understand that true value has to be paid for, sometimes at a premium. When you decide to increase your prices, you will discover that you are earning more money, and doing less work for more money as a result. Remember, business is about making money. But, money cannot be made if your business is not making any profit. You can have high sales volumes and $1,000,000 in revenue. If that money is completely gone after you pay your expenses, you have a money problem. Determine what are the causes of your money problems so that you can start generating a profit for your business.